I've been thinking about a "DOs and DON'Ts" article geared towards early-stage SaaS founders and upcoming SaaS founders for a little while now. I thought it would be a good idea to summarize what I've learned about SaaS in the last few years and put it into a format like this. Problem is, it's a very large topic, and if I try to make it as broad, deep and well-written as I'd like it to be I'll never do it. I don't have sixkidsandafulltimejob.blogspot.de like Benchmark's Michael Eisenberg, but three little kids, about 25 angel investments and Point Nine keep me pretty busy too. Some entrepreneurs will find this statement awkward because they don't feel like they've chosen a market. Some founders use a very systematic and analytical approach and evaluate a number of ideas first, but others just have an idea (or just happen to have domain expertise in a specific area) and get started without too much analysis and without ranking the idea against other ideas. There's nothing wrong with pursuing the first idea if you're really convinced of it and I'm sure that some of the biggest success stories began that way. But I do think that generally it makes sense for founders to do some due diligence on their idea, at least before committing the next years of your life and maybe your savings to it. Plenty of opportunities to increase your TAM (total addressable market) by broadening the product offering, moving upstream or going into adjacent markets. Chance to realize network effects, to become a platform or to create a data asset. Most of your target customers are still using old-school desktop solutions or make do with a combination of generic applications like Outlook, Word and Excel. Let's say you start with an invoicing app for small businesses. That alone is a sizable market, but it's also a great starting point to move into accounting and payroll, as well as to gradually target bigger customers over time. There's also potential for network effects (think e-invoicing between your customers), to become a platform (for a variety of adjacent apps) and to create a data asset (e.g. benchmarking data), which all helps to make your position more defensible and gives you pricing power in the long-term. The concept originated in late nineteenth-century legislation [...], which created new literacy and property restrictions on voting, but exempted those whose ancestors (grandfathers) had the right to vote before the Civil War. The intent and effect of such rules was to prevent poor and illiterate African American former slaves and their descendants from voting, but without denying poor and illiterate whites the right to vote. I initially thought that the lower your churn rate is, the tougher it will feel for you to offer generous grandfathering. My thinking was: If you have a low churn rate and therefore a long customer lifetime, you're giving up a lot of incremental revenues by not increasing your prices for existing customers. If on the other hand you have a high churn rate you can more easily do without the price increase because you're existing customers won't stick around for a long time anyway. Turns out this isn't true, at least if you expect churn to be constant – and if you're interested in the relative importance of the aforementioned incremental revenues as part of your total revenues (if you only care about the absolute dollars that you might be giving up, my original assumption is of course correct). 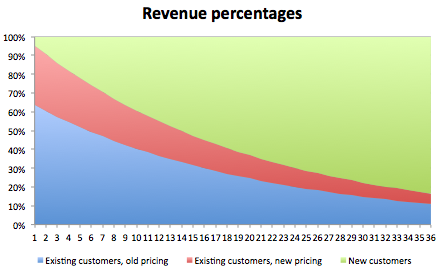 If you take a look at this Google spreadsheet (let me know if you'd like to get the Excel version) you'll notice that the relevant revenue portion that we're talking about (revenues from Group A customers due to pricing increase, cells E22-G22) is almost completely insensitive to changes in churn rate (cell B10)! Look at cell G22 in the spreadsheet, which shows the revenue portion that you give up by offering grandfathering for year 3. If your churn rate is 1% p.m. that percentage is 7.35%. If it's 3% p.m., the percentage goes down to 7.22%, almost no change. And if your churn rate is 5% p.m., again almost no change to that percentage (7.08%). The reason is that revenues from your new customers ("Group B customers" in the model) are affected by your churn rate as well, and that effect almost completely offsets the effect of your churn rate on your existing customers with respect to the question that I was talking about. If you think about it, it's logical, but my original intuition was wrong. 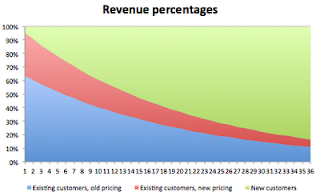 If you're running a SaaS startup it's likely that sooner or later you'll want to increase your prices. The reason is simple: It's impossible to find the perfect pricing right off the bat, so most startups launch with a pricing scheme that's on the low end to make sure that they don't scare away potential customers. "In the beginning, err on the side of being too cheap", was also one of the tips that I gave in my previous blog post about SaaS pricing. Now let's say 12 or 18 months have gone by, you've acquired your first couple of hundreds of customers, you've added lots of features and made your product better and better. By now you also have a better feel for what your customers are willing to pay, maybe supported by A/B tests with different prices or customer interviews, and you want to increase your prices. There are a number of questions that you'll have to answer: Do you want to keep the pricing model and just increase the amounts or do you want to change the structure of the pricing – axes, plans, limitations – as well? How much do you want to increase prices by? Are you introducing new features or editions that justify a pricing increase or are you going to increase prices for the existing offering? In this post I want to focus on just one question: Should the new, higher prices be applied to your existing customers as well or should their plans get grandfathered? At first you might be tempted to increase prices for your existing customers. They like your product and are used to it (and will incur "switching costs" if they switch to a different product), so most of them probably won't leave even if they are not thrilled about the price increase. The additional revenue from the higher prices will probably more than offset the revenue that gets lost due to some customers who leave. So increasing prices for your existing customers promises to give you an immediate, maybe very significant revenue bump. The main reason for grandfathering existing pricing plans is that it just doesn't feel right to attract customers, get them used to and maybe even locked into your product and then demand more. Unless the pricing increase is very modest or your customers all agree that the old price was way too low relative to the value of your product, this will almost certainly upset a significant percentage of your customers. Take a look at this Google Spreadsheet. If you're assuming a higher cancelation rate that will obviously happen even earlier. You can download the Google Spreadsheet to play around with the assumptions (or let me know if you want the Excel file via email, in that case you'll also get the charts which didn't survive the Excel => Google conversion). 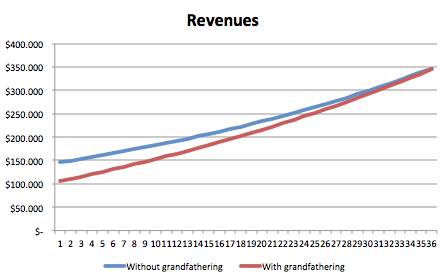 It depends on your assumptions if and when the positive effect of not grandfathering will reverse itself, but unless you're not predicting much growth it won't take very long until the additional revenue will have become a pretty insignificant factor. 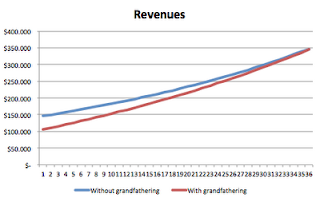 Importantly, I have not even taken into account the potential negative effect which not-grandfathering might have on your future growth rate by reducing referrals from your existing customers and generally by losing goodwill in your target audience (whereas generous grandfathering could motivate your loyal customers to give you even more referrals than before). These effects are hard to measure but I'm sure they exist and if you keep them in mind the decision will be even clearer. Finally, if you agree with the above, consider creating a "Customer Bill of Rights" which, upon signup, explains to customers how you're going to deal with pricing increases in the future. I think I've never seen this on a signup page but I'd be curious to find out whether this would have a positive effect on conversion rates.